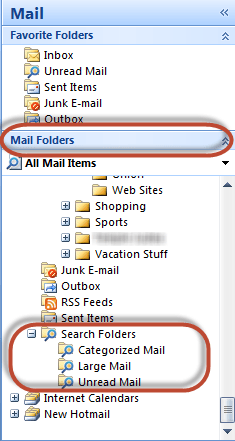 Microsoft Outlook™ has a little known but useful feature called Outlook Search Folders. This feature can save you time if you search for the same information over-and-over in your Inbox. An Outlook Search Folder looks just like a regular outlook mail folder in your Folder Pane. The only difference is that a Search Folder has a magnifying glass over the folder icon. Instead of an actual folder where you can move messages and store them, it is a virtual folder that match specific criteria you specify for that specific Search Folder. For example, you can set-up a Search Folder to search for a specific Email address, name, or keyword. In fact, there are three default Search Folders included with Microsoft Outlook (shown in the folder list above). Categorized Mail - All Email messages assigned a category. Large Mail - All Email messages that are 100KB or larger. Unread Mail - All unread Email messages. To locate messages from an important person, such as your manager. To locate all messages with a specific category or follow-up flag. Identify all messages with a “HIGH” importance. The first screen shows Search Folders for "Reading Mail" or "Mail from People and Lists". And if you scroll down further, you have additional options for "Organizing Mail". If you select any of these options, they present you with a Search Folder "template" where all you need to do is complete a few simple criteria. Here is an example to find all Email messages from your manager. Select the “Criteria” you desire. You can add additional criteria using the "more choices" and "advanced" tabs. Your new Search Folder will now be displayed in the Search Folder section of your folder pane. If you want, you can select “Show in Favorites to add the Search Folder to your “Favorites” section of your Folder Pane as well. (Note: The above steps are for Outlook 2010 - different Outlook versions will have slightly different steps). 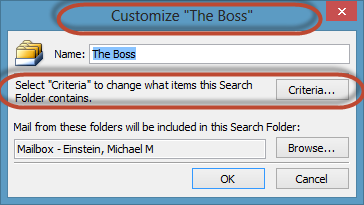 Select “Customize Search Folder” from the Folders tab of the Main menu. (Alternatively, you can "Right-click" the Search Folder and select "customize"). Select “Criteria”, and then change the specific criteria you want to update. Search Folders can be created for locations beyond just your Inbox. This includes data files such as your Personal Folders file (.pst) or your Archived Folders file (Archive.pst). 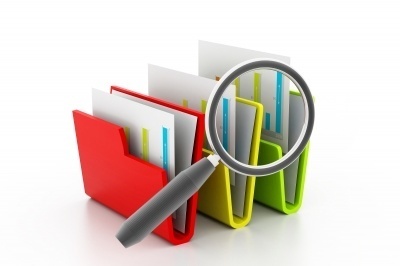 One powerful feature of Search Folders is that they can locate Email messages that meet the search criteria across multiple folders. However, Search Folders cannot search across multiple data files (such as if you use several .PST files in your Outlook mailbox). If you delete a Search Folder, the messages in the folder are not deleted. You are just “viewing” the messages in the Search Folder based on your Search criteria. But if you open or select one or more e-mail messages shown in a Search Folder and then delete them, the messages are deleted from the Outlook folders where they originated. Once it is set-up, make sure to remember to make use of your new Search Folder! Have you tried out Outlook Search Folders?